Is there a better alternative to Rock Guitar for Dummies? Is Rock Guitar for Dummies really the best app in Miscellaneous category? Will Rock Guitar for Dummies work good on macOS 10.13.4? Rock Guitar for Dummies needs a review. Be the first to review this app and get the discussion started! Rock Guitar for Dummies needs a rating. Be the first to rate this app and get the discussion started! eMedia Rock Guitar for Dummies makes rock-guitar lessons fun with over 70 audio and video-enhanced guitar lessons and rock gear tips which cover all the techniques needed to play rock, punk, and metal, including movable power chords, effects pedals, yanks, hammer-ons, pull-offs, palm muting, distorted riffs, the blues scale, using feedback, the whammy bar, and more!. You can start from scratch, and our revolutionary teaching style will have you playing songs, chords, and riffs within minutes! 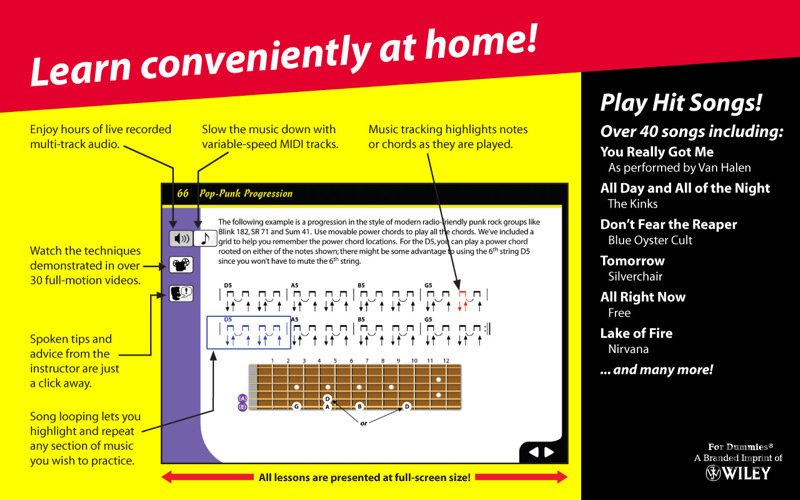 Instant Feedback listens to your playing and highlights notes played correctly in melodies so you can learn faster. Instructor Charles McCrone, a graduate of the cutting-edge Guitar Institute of Technology, has over 25 years of playing and teaching experience. Discover how to play rock guitar including how to string and tune your guitar, play simple chords, full chords, power chords and much more!